A simple night of grilling. Carrie wanted to cook the pork chops in the fry pan, but I told her I could do them on the Big Green Egg instead. After thinking about it for a little bit, she decided that would work. Took about an hour from lighting the fire, grilling, to plating the finished product. Not too bad! I used a new technique that I used that someone told me on Big Green Egg EGGhead Forum with their suggestion being that light the brick and leave it open a bit longer until more of the lump lights. Worked a lot better tonight lighting the grill. Temps before I started lowering it got up to around 400 degrees. Actually, at one point it went up to about 500 as I was inside and came back out to close things up and lower it back down to about 300. The temperature was still climbing when it was at 500, so I have no doubt I will be able to reach high temperatures in a few more grills. Cook pork chops with a stir fry style veggies. Good way to start the week. Have a great rest of the week and hope to post more grilling pictures soon. I am off to study and work on my class. After years of thinking about getting a Big Green Egg, I finally got one on August 19, 2017. I had been going back and forth thinking about a Traeger Grill or Big Green Egg. Finally, Big Green Egg won out. I like the idea that it is only me cooking and not relying on power to make the thing work. So far, I have cooked twice on the Big Green Egg. We cooked the day after we purchased and then again on that Monday. The only pictures we gathered were from Instagram where Carrie took pictures of the completed food. To start, we did a pork tenderloin. It is recommended that the first 4 - 6 grilling we keep the temperature 350 or below. This is to allow the Green Egg to seal and do it's thing. After those 4 - 6 grilling, then we can do higher temps. We are both dying to do a steak on the grill, but recommended to do those after a few grills as need a temperature of 600 or more. So, we are hoping to be able to do steaks next weekend. The pork tenderloin took about 30 minutes to grill. It took me a little bit to get the grill started, but once it lit it was easy to keep the temperature targeted right around 200 degrees. Open vent a little and it would shoot up or close it and it would go down. It will take me a little bit to get use to how it works. I thought the pork tenderloin turned out really well. Especially for my first try and using the Green Egg. Monday night, we grilled four chicken breasts with bone in. This night, it took me a long time to get the fire started. I had watched videos on YouTube about lighting and did exactly what they said not to do... I got the starters going and poured more charcoal and put out the starters. So, that extended the grill time a bit. Because the time was extended we did not eat until about 8:30 or 9 that evening. The only picture we got was of the chicken salad we made with the grilled chicken. 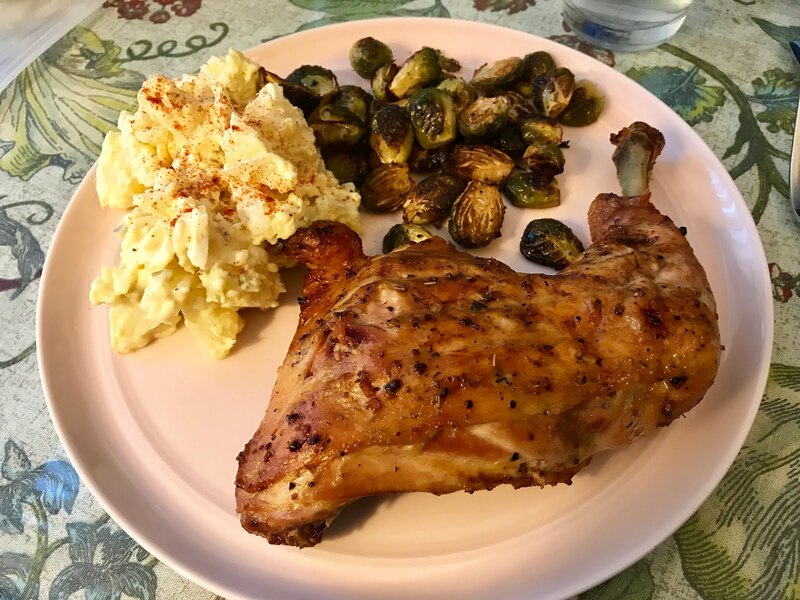 Let me tell you, that was delicious though as the smokey flavor could be tasted in the chicken salad. The grilling of the chicken breasts was also fun because with about twenty minutes left in the grill, it started to downpour. I had an umbrella and continued to cook. The rain did not seem to have any effect on the grill as it kept the same temp and I continued to grill. It was worth the wait as the chicken was moist and delicious. Catching us up today, August 27, I started off the afternoon doing four large chicken breasts bone-in. I did these at 300 degrees over indirect heat. They appear to have turned out perfectly. Internal temp got to about 160 before taking them off of the grill. These are actually for lunches this upcoming week. We used a simple salt and pepper coating on these and put them on the grill. When we did these the first grill last week, we coated them in Olive Oil and then coated in salt and pepper. That was recommend as we were using direct heat. This afternoon, we were able to skip the Olive Oil and use only salt and pepper with it being indirect heat. Carrie will take these and make chicken salad. I am not sure what else she has planned for these, but she said cook and I cooked. The indirect heat was done using the convEGGtor. First time trying it. I also used a drip pan. Smelled really good as they were cooking and I could hear the grease being caught by the drip pan as these cooked. Odd to be grilling and hear the sizzling of grease. The only thing we were wanting was the skin to be a little more done, but not sure how I can get that done with the indirect heat being used. I will browse the forums to see what people suggest to get a crispy skin for future grills. Finishing off the afternoon grilling were the leg quarters. Another hour and half grill. Set the Green Egg and forget about it. Turn every 45 minutes. These are dark meat, so we need to make sure the internal temperature is at least 200 degrees. The grill is set as before with indirect heat and a grilling temperature of 300 degrees. Early in the grilling the temperature did get to as high as 350, but the past forty minutes it has been right at 300. This finishes up the third grill for me on the Big Green Egg. It was a fun afternoon of grilling and after lots of chicken is done, we are ready to eat. and potato salad. It was good! Final dinner picture from the leg quarters tonight and they were delicious! Fun day and I learned more about how to grill on the BigEgg. This finishes up our third grill using the Big Green Egg. Two or three more to go and I can open up the heat to see how hot I can get it to go. So far, not very hot even when preheating. I was warned to keep the temperature below 350 as I mentioned, however, even when preheating the hottest I have seen it go is 400 and not much over it. Until next time, have a great rest of your Sunday and I look forward to grilling again soon! What a busy summer. Classes have already started for the fall semester. Seems like the summer just started. Seems to be what I hear everyone saying about where the summer went. It was a busy summer which made it fly by fast! I had actually planned on posting a update over the summer and making it plans for the summer. Well, that did not happen and here we are almost to the end of August. Wow! So, to provide some updates from the summer months here we go. The spring semester ended and I passed my class. Second class in the Communication and Leadership master program. Doing weekly postings and various papers for eight weeks kept me plenty busy. About two weeks after the semester was over, I went on a road trip to Minneapolis, MN for a bachelor party weekend. Erin and Greg wedding date set for June 10. 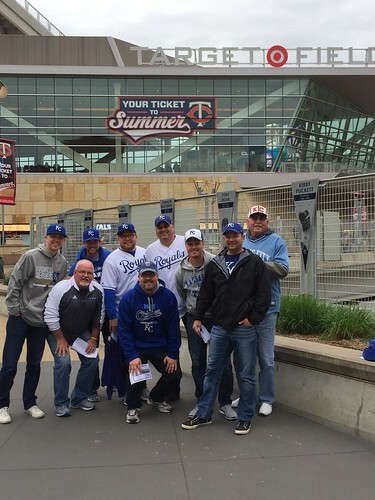 We did a road trip in a van to Minneapolis on Friday, May 19 and we planning to be there for two Royals games through Sunday. As it turned out, we were only able to attend one game on Friday night. We had a blast... even though the Royals lost. Sunday we spent the day eating, drinking, and having a great time. We had a lot of great beers and a lot of fun that weekend. I will remember it forever. I was honored that Greg asked me to be his best man. I will admit, I was a bit nervous about giving a speech in the upcoming weeks. I had plans to have it all written before the bachelor party weekend. That did not happen though and ended up writing it the week of the wedding. More on this later though. One of my favorite spots we went to that weekend was a Town Hall Lanes. A brewery with bowling lanes. 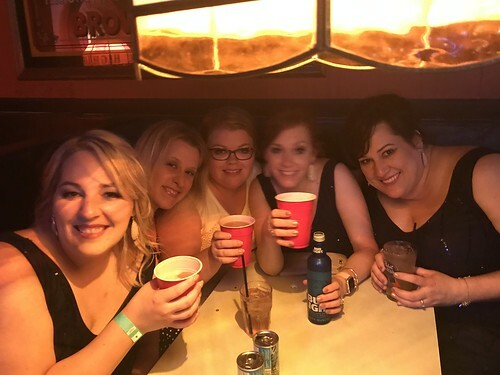 We had blast! I would not mind another trip to Minnesota to see a Royals game and go to that bowling alley. Fun time! We spent the afternoon at the boiling alley Saturday as it was pouring down rain. They ended up doing a double header on Sunday which of course we had to miss as we were driving back to Topeka. Still, we had a lot of fun and it was great to get to know the future in-laws and close friends of Greg. Great group! A week later we did another road trip to Dallas, Texas and then on down to Houston, Texas for a big party. We were gone for ten days and had a blast! 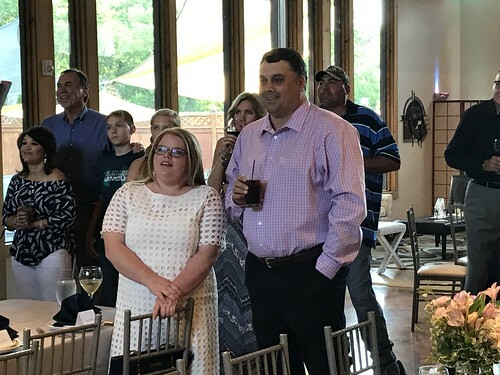 We were going down for a combined birthday celebration and wedding anniversary for Carrie and Tommy Galloway. A live band, dancing, and a whole lot of fun was had by all. We were in Houston for the Memorial Day weekend and spent the day at the pool. More fun before we finally drove back and spent a few more days in Dallas with my friend Javier. We hit up a lot of places to drink good beer and ate a lot of great food. Carrie and Corrie drove back to Dallas a day later and we continued to have fun going on wine tours and eating very well. Carrie and I were back in Topeka the week of the wedding for a few days anyway. I had a conference to attend in Hays, KS for work. I was out there Wednesday and Thursday that week. It was a great conference before the rehearsal dinner scheduled for Friday, June 9, 2017. This is the week that I worked on my speech for the wedding day. What a wonderful evening we had on Friday, June 9, 2017. Rehearsal dinner for Erin and Greg. The dinner was held at Arterra Event Gallery in Lawrence, KS. A beautiful location and wonderful setup for any event. The food was wonderful and the drinks were delicious too! 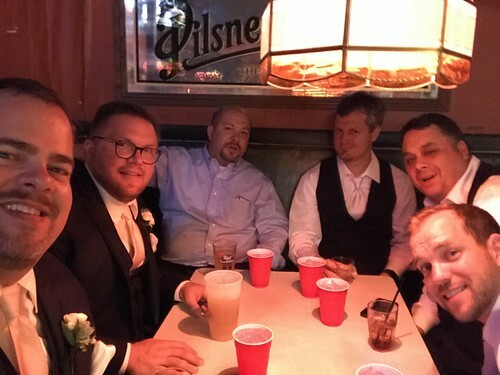 We heard speeches from the father of the groom (Eddie), brothers of Erin (Cole and Drew), Tommy Galloway (family friend referred to as Uncle Tommy and best friend of Eddie), and Robert (Uncle to Greg). With the weather perfect that weekend, we were able to sit outside and enjoy the outdoors while people visited before dinner. I was able to record all the speeches that evening, although I have not had a chance to export or do anything with them yet. I hope to have those available in a future post to share. It was a fantastic evening and prepared us well for the wedding day. The day of the wedding, Greg and I went to get our first straight edge shave. Nice and close shave although we both had to admit that when the aftershave went on it burned a bit more than we expected. It was a great way to start off the day. During the day, the guys stayed in the hotel while the ladies had their hair done and makeup in the afternoon. We had to be over at Macelis for pictures and prepare for the wedding by 3 pm that day. The guests were scheduled to start arriving about 5:30 and the wedding set for 6 pm. Beautiful wedding and everyone looked great! The reception began at 7 and time was getting close for Carrie and I to give our speeches. Food and drinks were so good! I am not sure why I did not eat more. I think it was nerves from having to give a speech. Of course by this time both Carrie and I had our speeches written and had gone through them a few times. For my speech, I had done research and tried to make it unique and light. I also wanted to have a lot of toasts in my speech. The one thing I forgot to do was make sure everyone had a full glass of something to drink. Other than that, I thought it went well. Carrie did a great job with her speech too. Here is my speech in full (Best Man Speech June, 10, 2017 for Greg and Erin Wedding) which I wrote up and had on my phone. It was better that way rather than me trying to read off of notes or remember what I had planned to say. I know everyone wanted to get through what I had to say so we could get to the partying, so I did my part and kept it less than five minutes. Following the reception, the wedding party, friends, and family went out on the Lawrence town. Great fun was had in Lawrence following the wedding. We were out late having fun and the plans were to be up early to do gifts. I think Carrie and I were a little late getting to the gift opening party the next morning. I think I was just a little hung over, but not too bad. Fun night! Two weeks after the wedding, we had Tap That Topeka to attend which is a beer tasting event in Topeka. This was the forth annual event and again, we had a wonderful time. We went with the newly married bride and groom and many of our friends. Another great evening! There was dancing and more drinking that evening following the beer festival. July 4 feel on a Tuesday this year, so it was very low key for Carrie and I. We did not fire off or watch any fireworks this year. It was kind of nice and we were able to comfort Oliver who was a little freaked out over the loud booms in our neighborhood. We stayed indoors and watched movies most of the day into the evening. A few more weeks pass and suddenly we are into the middle of August. 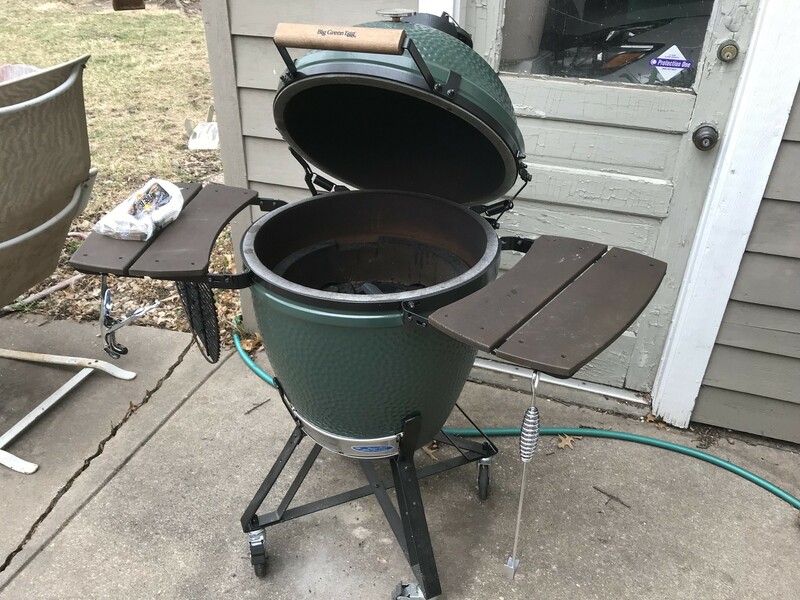 About a week ago I purchased a Big Green Egg. So excited to finally have a grill that can really cook and more import smoke meat. I have only cooked twice on it so far, but plan to do a lot more and try a lot of different cooking techniques. More on this in the upcoming months as I plan to post updates on what is cooked along with pictures. Note, I only made it to one Royals game this year and it was up in Minnesota. With classes having started this past week and my assignments all due on Friday (including papers), I am not sure I will make it to a game at Kauffman Stadium this season. I hope so, but it will depend on how disciplined I am in reading and writing for class. The Royals have struggled a few times this season and also had some good winning streaks. We are still a few games out of first where we have been most of the season. Still within striking distance and just barely out of the wild card hunt. I hope you have had a wonderful summer. 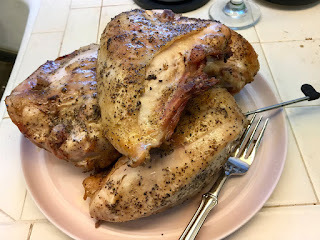 Watch for more posts regarding cooking and my experiences with the Big Green Egg.